London-based, German-born architect and design artist, Timothy Schreiber is known for his furniture designs which have won multiple awards including the Red dot design award. He is the only designer having won this award three times consecutively. What Do We Know About The Author? Timothy Schreiber was born in 1973 in German. He initially trained in cabinetmaking in Germany before studying architecture and design at the Bauhaus University in Weimar (Germany), the University of Stuttgart (Germany) and the Westminster University in London (United Kingdom). During and after his studies he worked with numerous architects, including the German Guenther Behinsh and the winner of the Pritzker Price in London, Zaha Hadid. In 2003, he spent a year living and working in China where he was involved in the design of the Beijing 2008 Water Olympic Aquatic Center (Water cube). Since 2005, he has paid particular attention to the development of custom furniture and art objects. Plooop Chair © Timothy Schreiber. This British contemporary chair design gives the weird appearance of innovative chair backrest design. Timothy Schreiber creates this Plooop Chairs with considerable delivery of soft furniture color. The main cornerstones of Timothy’s design approach are a predominantly digital workflow and a strong focus on multidisciplinarity. He uses a wide range of digital tools to incorporate various forms of “micro intelligence” and “scientific phenomena” into the concepts of his works. During its design process, complex virtual models emerge which are then materialized by choosing the most appropriate available digital or traditional production methods. 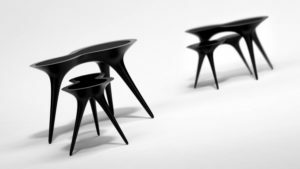 In 2013, Schreiber started working in fused glass with his “icicle tables” as his first series of furniture in this material. He applied the technique of fusion of traditional Chinese glass to this Liuli, making his projects the first LiuLi furniture. In 2015, Schreiber showed his first works (Table Methodology) in the Bronze cast during the SOFA show in Chicago. He won several awards and prizes including the Red dot design award. He is the only designer having won this award in furniture category three times consecutively. What Are The Main Characteristics Of Fuksas’ Most Famous Works? The PAN_07 chair was designed and manufactured by Timothy Schreiber in collaboration with Sean Hanna takes inspiration from advanced cellular lattices that occur in nature to minimize weight but maximize resistance to force. 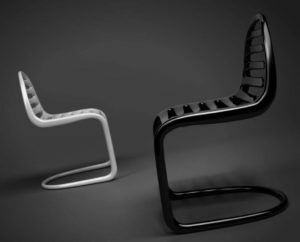 The design method with which this chair was made combines the principles of evolution and artificial intelligence to create a material that responds to its environment by increasing the density in the areas necessary to better withstand the external forces applied when the chair is in use. In fact, inside it is made of a fine grating that reduces the weight to a minimum in order to increase the resistance. This kind of control over the internal properties of the material is only possible with today’s modern digital fabrication technology that creates a modular structure with spatial structure of small interconnected struts. A section through the vertical leg of the chair, for example, reveals cells with greater density towards the surface to counteract the higher tensions or compressive stresses that occur when bending. 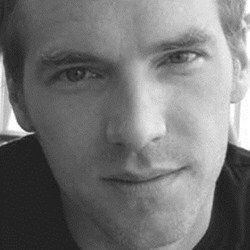 In 2006, Timothy Schreiber won a Red Dot Award for his Pan 07 chair design. The E-volve table represents a modern indoor/outdoor garden table. It is organic in its composition and smooth to the touch. The design of this original design table was conceived by the natural “growth” process. 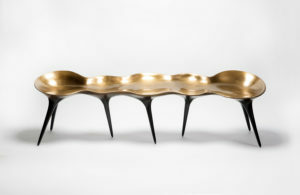 The design of the E-volve table, by the German designer Timothy Schreiber, is evocative of natural forms, which translates into a unique piece of sculptural art. The graceful, elegant and fluid design of this round dining table imitates the organic forms of nature while the three table legs grow and branch together to form a solid and stable base on which the transparent table top rests. The extra clear transparent glass allows this unique design table to be admired from all angles. The highly polished stainless steel frame gives this interior/exterior table an ultra-modern look and makes an unforgettable statement in any design garden or modern interior space. In 2007, Timothy Schreiber won a Red Dot Award for his E-volved table design. This chair is a nice piece of Timothy Schreiber collection. Morphogenesis Chaise was created by the English designer and artist, describing his work as “pop modernism” and the bedside chair is computer-designed and hatched by carbon fiber with a soft microfibre surface to give you a complete space to philosophize over life while at the same time you can tilt a little with the chair and think why such a case costs the box. On the other hand, it is art, and such a thing is to keep the price or even rise in the long term. 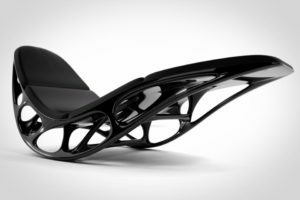 Schreiber’s design process of Morphogenesis Chaise started with an intensive research process of natural structural systems and micro structures. The gained understanding was then translated into the realm of furniture design while constantly shifting various parameters keeping basic requirements like comfort, size and usability in mind. This process was fully digitized and computer aided up to the level of structural testing, dimensioning and optimization of the individual elements. 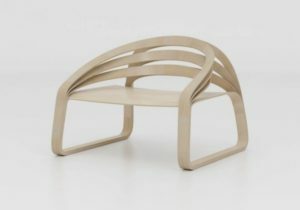 In 2008, Timothy Schreiber won a Red Dot Award for his Morphogenesis Chaise design. 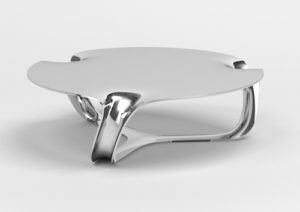 Flow Drip Metal Coffee Table. The reflective polished aluminum and curved shape keep this lower than normal table looking different as light and shadows play off its surface. Timothy Schreiber is one of those designers who leaves no one indifferent to his work. Inspired by nature and highly driven by today’s advancements in digital technology, he brings a breath of fresh air that has fascinated many people. He implements cutting edge equipment and techniques from development to finished product. His pieces combine comfort with functionality and imagination with cutting-edge design. Schreiber’s designs are the outcome of his ambition to delve into and challenge boundaries between architecture, digital design, manufacturing methods and social/environmental sustainability. He is inspired by everything around him and states that some minor changes in the shape could allow the design to use a thinner metal and thus make the box lighter. Naturally, as far as my most organic forms are concerned, he has found much inspiration in natural phenomena, mainly through the study of microscopic cell structures. Contemporary rapid production technology opens the door to new concepts that were previously not achievable.